Mind-blowing, inhuman deathcore could leave the staunchest metal-hater with his or her mouth agape. 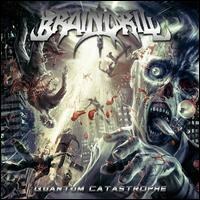 "Brain Drill are one of the most musically over the top bands I have ever heard. They are truly raising the bar for technicality, velocity, and overall extremity in death metal.” - Alex Webster of Cannibal Corpse. Ben Lomond, California, is a small town off Highway 9, outside of Santa Cruz, essentially on "The Peninsula" (what we, in the San Francisco Bay Area, call the jut of land that stretches from near San Jose to San Francisco, separating the San Francisco Bay from the Pacific Ocean). I've been there many times on lazy drives and it is a gorgeous area, nestled amongst redwood trees, emitting a sense of peace and isolation. As of the 2000 census, a little over 2,000 people lived there, and it only occupies less than 1 square mile. Brain Drill are an absolutely inhuman death metal band -- extremely technical, with guitar chops that should put Vai and Satriani to shame (though, music-wise, there's not much of a comparison). Rarely have I heard music so intense and mind-blowing, and they are purportedly from Ben Lomond, CA. I wish I had the true story on all of this, because in their short life span (about 5 years), they've been in constant state of lineup changes. And that many people who can play music like every member of Brain Drill can't possibly be from Ben Lomond, CA. It would be hard to find guitar virtuosos and tempo-destroying drummers like this in Los Angeles or New York City. At any rate, the most important things are that Brain Drill exist (especially after rumors of breaking up in 2008), that they've released one of the best albums I've heard all year, and they have brought into my world more ear-shattering music of brainy metal, now included in my sadly short list of bands like the Dillinger Escape Plan, Candiria, Meshuggah, and Converge, even though Brain Drill are more easily classified as "death metal" than those groups. Set against the most grandmother-murdering aural assault you could imagine, the guitarist and bassist run up and down scales in ways that even power-metal gods Dragonforce could never fathom. Even if you hate death metal, you've really gotta hear this. It does exactly what I want my heavy metal to do: it makes me ask, "How in the hell did they do that?"